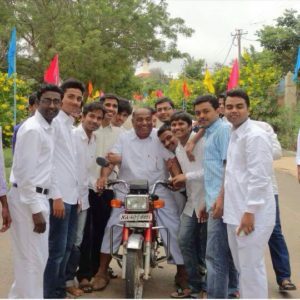 Dwarkanath Sir, lovingly called by all his adorable students was a Karma Yogi chosen by Swami for HIS education mission. He was man of mettle with a rare mix of stern character and a compassionate heart. He was also blessed with yet another unusual combination of vibrant personality with multiple facets and incredible energy. The beauty of all this was a life beaming with talent, liveliness and energy dedicated to SAI Mission. He was inspired at young age by Sri Madiyal Narayan Bhat and other Loka Seva Missionaries, which brought him to choosing a path of celibacy for achieving his dreams. He was drawn to Sathya Sai Loka Seva Vrindha, Muddenahalli at a tender age of 18 in 1976, with burning passion and patriotism for contributing his life for Education Mission under the direct guidance of Bhagawan Sri Sathya Sai Baba. He was a Thyagjeevi of a difference, in both character and approach, which gave a spiritual dynamism for other Thyagjeevis. He had a child’s heart, always joyful, sport enthusiast and inquisitive explorer, daring to experiment and learn fast. Obviously these attributes attracted children, which he further strengthened by his imposing character and unrelenting enthusiasm. The responsibilities he successfully took upon stands testimony to his versatile personality and the depth of his commitment. After teaching for few years, his vast knowledge and dedicated workmanship took him to be in charge of the farm and Goshala for more than 10 years (1980’s). This is when the hostel saw in house self sufficiency in many freshly grown vegetables and grains. There was a time when he toiled for providing children in the hostel with home grown fruits like grapes, papaya, mangoes and guava. On the grains side he was successful in reaping a harvest of paddy, raggi and jower. The striking difference of impact he brought to the field of agriculture in those days was admirable. The sewage water of the campus was used for irrigation, when there was no concept and technology of recycling the waste water. This demonstrates the innovation and vision he had for the Institute and Mother Nature. The current water storing dams across the farm, the greenery with coconut trees and the landscaping of the valley terrain of the hilly region was all his hard work during those crucial days. Muddenahalli campus was one of the first Sai campuses to introduce and implement Swami’s advice of having in house Goshala for meeting the pure milk needs for the children in the hostel. We should remember the immense services of Dwarkanath Sir in not only making the pure home procured milk requirement self sufficient, but also selling the milk to KMF society, Bandahalli for many years. His enthusiasm and dedication started attracting the attention of seniors, including Sri B N Narasimha Murthy, who started molding him for bigger responsibilities. While around same time (1980’s), the school campus at Muddenahalli was growing with lots of construction work. He quickly learnt the intricacies of civil engineering and finances of building industry. Almost all the buildings built before 2011 has his hardships in the form of complete overseeing of both execution and stringent financial management of the projects. His nature of saving even smallest penny for the organization is a hard lesson to learn from one of the founding legends. We want to narrate one small example of his leadership in the efforts for the growth of the Muddenahalli campus. It was 1981 summer holidays, while the auditorium (Sai Hrudhyam) was being built; many students had stayed back for the shramadhan (service) to help the construction, by then the biggest project of Muddenahalli which cost 18lacs. A group of 10 inspired students under Dwarkanath Sir’s direct motivation loaded the tractor with sand (for construction from a small valley near to current hill view stadium) in record 12 minutes, which is by all standards difficult for even the professional labor force. We relish this experience and extract energy from these inspirational 12 minutes all my life being a youngest member of the group (eldest being Dwarkanath Sir probably 25 years at that point). The rich experience and expertise of his in all aspects of building construction, as you know later, made him the key instrument for Swami to entrust a big responsibility in HIS expanding mission of replicating and building the new school campuses. It is now a reality that, Dwarkanath Sir put his heart to devotedly complete this task in utmost meticulous and magnificent Swami loving and approving way in Gulbarga, Mudhol, Bijapur and Hassan. Another unassuming role which Dwarkanath Sir took up diligently was filling the big void at Muddenahalli campus along with five to six key Thygajeevi leaders in 1982, when Swami in HIS Divine master plan surprisingly entrusted higher responsibility by commanding Murthyanna (Sri B N Narasimha Murthy, then secretary and warden of Sri Sathya Sai Loka Seva School, Muddenahalli) to reallocate to Puttaparthi. This key responsibility he continued to deliver becoming an important force and core policy making leader until 2011. The another Karma Yogi aspect of Sir which was expressed in a vivacious but sanctified way is, his tireless efforts as one of the team leader for decoration of Bhagawan Baba’s birthday celebrations at Prashanthi Nilayam, Puttaparthi for more than 20 years. If Surendra Sir was the concept provider for the glorious decoration theme, Dwarkanath Sir’s team executed this to the highest standards, which made our sweet lord Mother Sai overwhelmed. It was humbling to witness each and every year Swami, inspecting before the convocation (on 22nd evening) the intricate details of the decoration, when both Surendra Sir and Dwarkanath Sir (HIS instruments in this role) getting guidance from universal master, bringing last minute fine tuning of HIS creation (decoration). Dwarkanth Sir’s daunting energy, palpable enthusiasm and diligent endeavor to bring out pomp, yet a pious makeover of Prashanthi Nilayam for the most adoring celestial day for millions of devotees across the globe writes volumes of his devotion and dedication to Swami, the Avatar of the age. He was an inspiring teacher, who encouraged students to unravel their hidden talent. 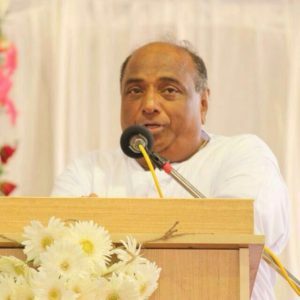 With rich experience in teaching and administration, he was a naturally admired principal of Sri Sathya Sai Pre University College, Muddenahalli from 1999 to 2011. He has inspired and molded thousands of students who are now responsible citizens in various walks of life, across the globe. The year 2011 will be remembered in coming years as a defining year in many aspects in Sai Calendar. When the world was still reeling with the shock of Swami leaving the mortal coil, as HIS divine plan the Mission continued and this is where the faith and conviction was put to test as all avatars have gone by. Swami in HIS mystical and magical ways continued to command and guide Sai Mission. It was in the month of August 2011, Swami in HIS unfathomable way commanded Murthyanna to proclaim HIS will of setting up a Sathya Sai Educational Institution in rural part of Gulbarga. Swami, as always, meticulously gave timelines of the Bhoomipooja for School building to be in November 2011, School to start following academic year, June 2012 and inauguration of the School building to be in November 2012. Swami in HIS charismatic style named the School as Sri Sathya Sai Vidyaniketanam. When the fact of Swami guiding in subtle form was still mysterious and baffling, HE, in HIS enigmatic style had given daunting time lines for the Gulbarga School Project. This is when your core conviction is tested and the deep faith is revealed. It was Dwarkanath Sir, who stood tall in this calling of the faith and conviction. He went by his heart and conveyed to Murthyanna to give him yet another new opportunity to serve Swami in HIS continued Mission. He was serving as Principal of Sri Sathya Sai Loka Seva Pre University College and was drawing handsome government remuneration (College was under the ambit of government aid). He still had three years of service (before retiring), he resigned right away, sacrificed all the comforts for an undefined tiresome challenge in far away land with only bare amenities to live for the purpose of multiplying the Sathya Sai Educational Institutions. He plunged into sequence of actions, starting from looking out for the land to the demanding task of execution of the building work as willed and timed by Swami. The hardships in making of the building and the campus in less than 9 months with time and tide being against should be written in golden letters. In spite of all the commotion and maneuvering which happened right through, around him in the course of establishment of Swami willed institution, Dwarkanath Sir stood steadfast as a true instrument and contributed immensely in completing the Swami’s project. It is history now that all the three predictions of Swami (as always) happened in an immaculate timed way and magnificent imposing campus has already churned out three batches of students who have been provided value based education absolutely free of cost. Sri Sathya Sai Vidyaniketanam is now a complete institution with all amenities in place with more than 350 children being imparted SAI education. This complete surrendered responsibility of his to the continued Sai Mission (the first project which happened post April 2011) has for sure changed the history and course of the Sai Yuga. Dwarkanath Sir’s efforts and hard work made Swami very happy and in fact, let us all pay our obeisance to Sir, for he was chosen to receive the first manifestation of love (in the form a ring) from Swami in Sukshma Swaroopa in November 2012. 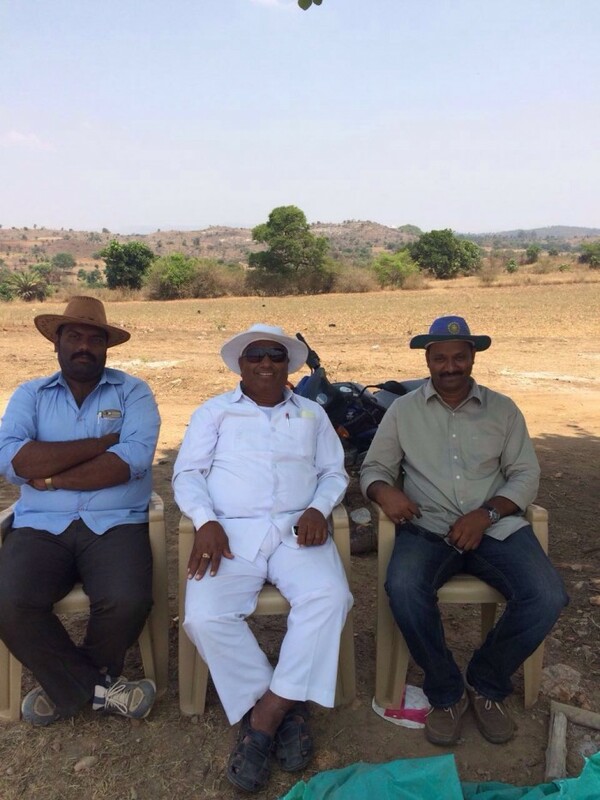 The good work of Dwarkanath Sir got him more responsibilities, which he endeavored in same zeal and focus. His contribution as the key leader in making of Sri Sathya Sai Premaniketanam, Bijapur campus and literally at the same time Sri Sathya Sai Anadanikethanam, Mudhol campus, makes one wonder the amount of energy and intent he adorned for Swami. Once all these three Institutions (Gulbarga, Mudhol and Bijapur) were efficiently operational, his long time prayer of contributing to building of an educational institute in his home district, Hassan was blessed by Swami. 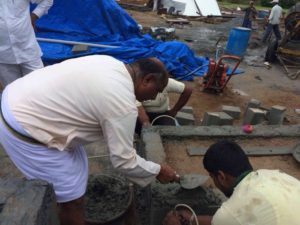 With more experience and prayers on his stride, he toiled through in the making of Sri Sathya Sai Sathyaniketanam, Hassan campus happen in record of less than 8 months from process of procuring land to starting the classes for students in this academic year (June 2016). This is a modern day miracle, an impossible undertaking which could only happen because of his prayers and hard work. He was respected Chairman of Sri Sathya Sai Sathyaniketanam, Hassan until he merged in Swami. He was and will be an inspirational powerhouse, who led a life of proactive spiritual seeker with steady Service (Seva) as his mantra. He feared nothing to venture out once the command of Swami was conveyed to him. The roles and responsibilities he took on himself, revitalizing his abilities in executing with precision perfection, in spite of most difficult circumstances and impossible probabilities is the biggest asset he leaves behind for us to emulate. The only way we can convey our deep respects to this energetic, devoted selfless soul is by imbibing the values and strengths he adored and stood for in our daily lives and etch out our time and efforts in the roles for the betterment of the society. His resolute devotion to Swami and relentless dedication to Sai Mission is the legacy he leaves behind for us to carry forward. We, the Children for Sathya Sai, offer our respectful salutations with deepest reverence to this selfless legacy, Dwarkanath Sir. 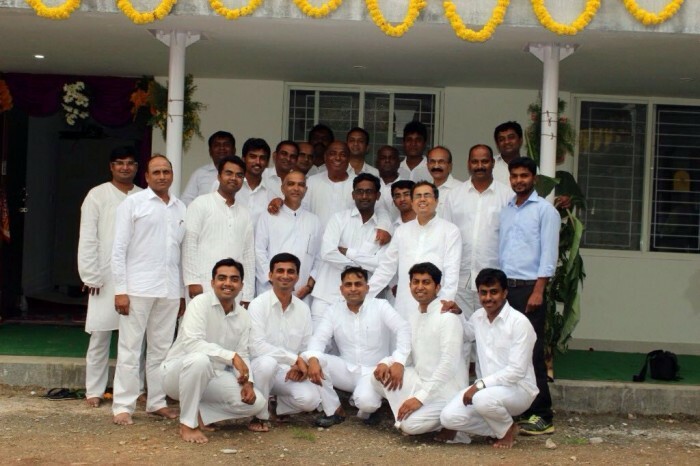 Sri H S Dwarakanath was the Principal of the Sri Sathya Sai Loka Seva PU College, Muddenahalli. Swami instructed him to go and take up the Gulbarga campus project. At that time, he was drawing a big salary as Principal as the institution was aided by the Government. In fact, when I asked Dwarakanath, if he was ready to go? He said, – “There is no question of asking any questions. If Swami has said, I am going!” He resigned as Principal of PU college in Muddenahalli. The campus at Gulbarga is set up in one of the most backward areas. There was no building to start with. We had rented a place in Gulbarga city to stay whenever we travelled there once in a month for overseeing the construction. Whereas, Sri Dwarakanath chose to stay in a hut on the construction site. Here was a double graduate, drawing a big salary, giving up his job to take up such an assignment. These institutions are possible because Swami has moulded such people. We told him we will give some remuneration. He said, “Swami has given me everything. I do not want a single paisa”. I challenge the students that you can get only one Dwarakanath anywhere in the world. You cannot purchase such people. Swami moulded them. The life of these institutions is these dedicated men, Tyagajeevis. These are the instruments. Swami can do anything anywhere. But that is not His way. He wants instruments. Good work will happen only when there are good instruments. Dhwarakanath Sir scolded a boy ‘DanaKayone’ (a scolding which means ‘one who is fit for grazing cows’) Shettigar Sir, who is witness to this, says ‘Sairam Sairam, instead of ‘DanaKayone’ if you could say GOPALA you could have benefit of NamaSmarana’. I am a Alike and Parthi alumni and I remember the first time I saw Dwarkanath sir. I was visiting Muddenahalli on the way to Puttaparthi. It was evening time and I saw the students on the playground playing football. Amidst the young students there was a huge personality fighting for the ball…with the same childlike enthusiasm as the children around him. Seeing a teacher giving himself to the joy of being with the children was a wonderful sight and I felt the children around him were so fortunate. That was Dwarkanath sir for me. I am also an alike and Parthi alumni. The first time I saw him was In Parthi. Every year Muddenahalli teachers and students got the opportunity to decorate Kulwant hall for swami s bday. He used to sit around with the students all night decorating the mandir. I observed that students just loved to hang around with him. Seeing that even I felt like being around.i went and sat with him for a couple of hours and he was very patiently tying the flowers into a Mala and at the same time joking around and making all the students around him burst into loud laughter. I was kind of inspired by him though nothing much was spoken. I am an alumnus of Muddenahalli (2004-06) and Prashanti Nilayam (2006-13). Coming all the way from Kerala, I couldn’t understand a single word in Kannada! On the first day of my PUC, our English teacher was entertaining the whole classroom with his jokes and comments when we were introducing ourselves one by one. I was surprised because most of those jokes and comments of Dwarakanath Sir was in Kannada, and quite fast one too. I had absolutely no clue what he said, but everyone in my class were laughing their hearts out, but I knew for sure that this teacher was the ‘coolest & friendliest’ among the lot! I knew the only way out for me, is to learn Kannada in order to converse with him and of course with my classmates. In a way, Dwarakanath Sir pushed me to learn Kannada as well as English too! But what inspired me the most, was the fact that he is down to earth humble as a Sai Sevak, but a hard taskmaster when it comes to work! He had difficulty in walking since one of his legs had an ailment, yet he never complained. Day in and day out he was engaged in Swami’s work. He has walked the length and breadth of Muddenahalli campus overseeing many constructions bearing his leg pain! Most importantly, his love for students is unconditional. Whenever Sir visited Parthi, we Muddenahalli alumni at Parthi used to run to Sir. He holds our hands very tight ALWAYS! Shows how much he loves us. I am sure Swami has called him back for a higher purpose. Jovial large hearted person does describe him well. Also he was a force in himself, adhering to the tight deadlines laid down by Swami and ensuring projects are completed with least cost and max efficiency was his style of working. One of the greatest thing that sir taught me was towards respecting the food we eat. Remember, he did not teach us the underlying spiritual meaning but he took to a very basic level of the process of how the food come to us and the various trouble people take in making that happen. He himself set an example by literally cleaning the plate to the last morsel. He was a man who practiced and then asked others to follow. Even for service activities he was the one who came first to the spot, dirty his hands and went last. It is rare that we get teachers of such stature, knowledge and humility. Such teachers will be always extolled and remembered for generations to come. We will certainly miss him as a person but his love and warmth as a teacher will always enrich our hearts. May Lord Sai bless sir with liberation and may he enjoy the lap of mother Sai forever. Dwarakanath is a man of courage, valour, selflessness, affectionate. He is a symbol of obedience and humility that he would follow the words of Swami and the leaders of the organization implicitly without any second thoughts. He is born for Swami’s Mission. He is an example and a roll model for us to follow…. Some people change your life forever, leaving a lasting footprint in your heart. Dwarakanath Sir was one such person in my life! His influence in my life has been immense and I will always be grateful to him for having played been such an important part in shaping me and my life. Even now I can remember the instance from my 10th Standard. Sir used to teach us English subject, jointly with Vasanth Raj Sir, who was then the high-School Warden. His teaching style was starkly different from the other teachers. He never opened the textbook while teaching. His classes used to always be fun and learning combined, spun in a way only he could. Once when he was talking to us about the bombing of Hiroshima and Nagasaki during World War II, he took the entire class on an imaginative tour of what it would have been like for victims. Caught unaware, how would they have thought, experienced and undergone? Encouraging us to think empathetically, he explained to us how no one could take shelter in water bodies due to soaring temperatures after the bombing. By encouraging us to imagine and think, he not only piqued our little brains to think harder, he also tugged at our heart strings by giving us an overview of the human catastrophe and tragedy wars caused. What can I say… It’s been more than 13 years since that day in class, but I remember everything he said and taught, word-by-word. Such was his influence! It’s a known fact that sir was a very strict teacher. He was a disciplinarian and encouraged all of us to follow the rules. But underneath all that strict exterior was a loving and soft core. Sir had always liked me and once he went out of his way to help fulfill an innocent desire of mine. Once, after school, when my friends and I were having our evening snacks, Sir happened to pass us by. We had been served ice creams that day – those were the days when ice-cream would be given as snacks in Muddenahalli only twice a year. So, as you can imagine, we all were devouring it happily! My heart yearned for one more cup of ice-cream and I mustered the courage to ask Sir to help me get one more! And He obliged. He took me along with him to the snacks counter and requested the Krishna Murthy sir, who was supervising the distribution, to give an additional ice cream to me. However, Krishna Murthy refused the request, saying he couldn’t give an additional ice-cream to just one boy. While it was the right thing to do, Dwarakanath Sir, for my sake, requested him several times in a very polite manner and managed to get an extra ice-cream for me. Even as a child, I knew that my desire was a little too ambitious, but just to appease my one desire, Sir went out of his way to try and get me one more cup of ice-cream! Apart from getting an additional ice-cream that day, I learnt many beautiful lessons for life. I learnt that we should do everything in our capacity to help others. I learnt that no matter what the response from the one we seek help from, we should always speak politely and with love. I learnt that the best way to inspire and lead others is to live the lesson you want them to follow. Sir was a modest commoner with a rare, giving heart. He was a force, a strength, which inspired all his students to want to do better and be good. He was humorous and had an uncanny ability to connect with everyone at a personal level, be it his students or colleagues. He was extraordinarily talented and even directed several plays. A play titled “Bhakta Prahalada”, which was staged during Ganesh festival in the year 2001 was directed by him. It was the first-of-its kind in the history of Muddenahalli. He was well-read, a treasure trove of knowledge. Once when I was participating in a speech competition, I sought his help to prepare. The topic was on history and I remember being supremely impressed by not just depth of his knowledge on Indian and world history but the expansiveness of it. He spoke eloquently about topics ranging from the history of Uganda to the revolution in Vietnam, led by its revolutionary leader Ho Chi Minh. But the magnanimous personality that he was, I realise now that it is a benchmark I can rarely meet. He was an ideal man, an ideal teacher and an ideal devotee, who excelled in everything he did. Let us all offer our prayers at the Lotus Feet of our beloved Swami, to rest his soul in peace. So sad. May he RIP. I remember Sri. Dwarakanath Ji very well when I was associated with the school from 1986-1989. He used to teach Physics and there was question asked in the class room “What is Science”, the answer was Science is vision of truth. He used to give lot of analogies on physics especially magnetism etc., Faraday’s voltage law and lost of things I still recall and recollect. Nice human being . It is very sad that he is no more physically. Very energetic and always jovial in nature . He along with Sri RamaMurthy had a huge impact to our batch mates. During the Bhagvad geetha session in the auditorium, Krishna’s statement which is very famous “do the karma, results will come automatically” , I was never able to digest this since without knowing the end result , how to act was my question and in 2009 , i experienced this myself and was able to realize the essence of the statement.